Jonathan Rea secured a podium finish at the second round of the World Superbike Championship at Aragon on Sunday. 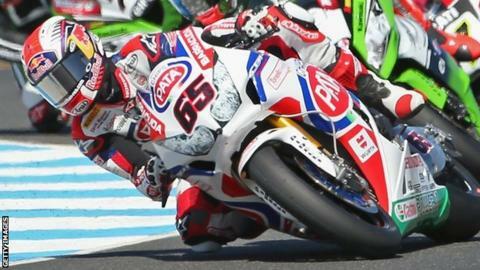 The Pata Honda rider was third in the first race and fifth in the second to lie fifth in the series standings. Eugene Laverty recovered from an early error to finish fifth in race one, and a sixth place in race two sees him lie sixth overall, two points behind Rea. Reigning champion Tom Sykes was a double winner, beating Kawasaki team-mate Loris Baz on both occasions. Sykes now heads the championship on 75 points, four ahead of Baz, with Sylvain Guintoli third and Marco Melandri fourth. Rea and Crescent Suzuki rider Laverty have 48 and 46 points respectively, ahead of the third round at Assen in two weeks' time. Rea got the better of Davide Giugliano to claim a rostrum position in the opener at the Motorland circuit in Spain. A perfectly-timed slipstream down the back straight on the final lap saw the Northern Ireland pilot move into third. The Isle of Man-based rider ran fractionally wide however and Giugliano saw a small gap. The pair clashed and the Italian came off worse, dropping his machine before re-mounting to finish in eighth place. Laverty's early mistake saw him back in 13th place, but he recovered to come home behind Ducati-mounted Chaz Davies.